Gahirmatha Beach is a beach in the Indian state of Orissa. The beach separates the Bhitarkanika Mangroves from the Bay of Bengal, is the World's most important nesting beach for Olive Ridley Sea Turtles. The beach is part of Gahirmatha Marine Wildlife Sanctuary, which also includes the adjacent portion of the Bay of Bengal. 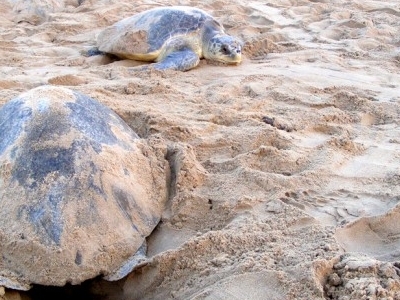 Orissa boasts of possessing the world's largest known rookery of Olive Ridley sea turtle. Apart from Gahirmatha rookery, two other mass nesting beaches have been located which are on the mouth of rivers Rushikulya and Devi. The spectacular site of mass congregation of Olive Ridley sea turtles for mating and nesting enthralls both the scientists and the nature lovers throughout the world. This unique phenomenon is hardly seen anywhere in India. That rarity of mass congregation and the cruelty meted out to these innocent marine creatures, paved the way for declaration of the stretch of water body from old light house near Batighar to Maipura river mouth as Gahirmatha (Marine) Wildlife Sanctuary. 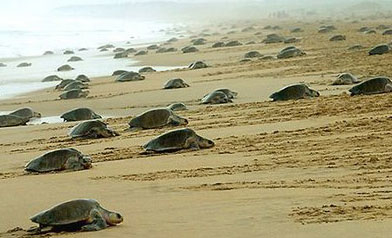 Gahirmatha is the only marine wildlife sanctuary of Orissa. This was notified as such in Government of Orissa, Forest & Environment Department Notification No. 18805/ F&E dated 27 September 1997 and published in the Orissa Gazette, extraordinary No. 1268 dated 17 October 1997. The total area of the sanctuary is 1435.0 km² which includes 1408.0 km² of water body and 27.0 km² of land mass including reserve forests, mud flats and accreted sand bars. Core area of the sanctuary consists of 725.50 km² and the buffer zone accounts for 709.50 km². The entire sanctuary area comes within the revenue district of Kendrapara. Olive Ridley sea turtles migrate in huge numbers from the beginning of November, every year, for mating and nesting along the coast of Orissa. Gahirmatha coast has the annual nesting figure between one hundred to five hundred thousand, each year. 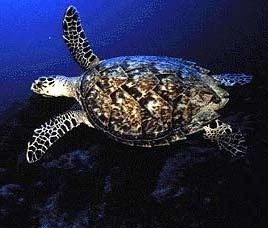 there has been decline in the population of these turtles in the recent past due to mass mortality. All the species of sea turtles in the coastal water of Orissa are listed as "endangered" as per IUCN Red Data Book. The sea turtles are protected under the 'Migratory Species Convention' and CITES (Convention of International Trade on Wildlife Flora and Fauna). India is a signatory nation to all these conventions. The 'Homing' characteristics of the Ridley sea turtles make them more prone to mass casualty. The voyage to the natal nesting beaches is the dooming factor for the sea turtles. Since Gahirmatha coast serves as the natal nesting beach for millions of turtles, it has immense importance on turtle conservation. Here's the our members favorite photos of "Beaches in Orissa". Upload your photo of Gahirmatha Beach!